Not many scuba divers know that the clear waters of Ireland are as beautiful as its natural landscape above the surface. 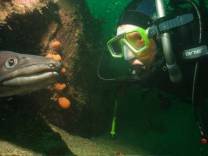 Just outside Cork harbor we can dive the famous Sante or Santo wreck. The legendary island of Ireland has a rich history, often hulled in mist with uncountable tales and legends. Ireland is known for its beautiful green valleys, its crispy mountains, ancient ruins and picturesque hiking trails. In the north of Ireland you can find the county Donegal with Malin Head, the Aran Islands and Tory Island. Situated in the east, the capital Dublin is with its Irish pubs a great place to begin your dive journey. You can make some gorgeous hikes inside Wicklow Mountains National Park or visit the offshore islands Lambay and Dalkey (the Muglins). The South offers stunning highlights such as the old city of Waterford, Baltimore but also Cork with its fantastic Red Abbey and cathedrals. Galway with its many festivals, beautiful bay and pretty shore is located in the west of Ireland, together with Kilkee and Limerick. Other highlights are the Cliffs of Moher, the Ring of Kerry and the tombs of Newgrange. Divers are blessed with a wide variety of dive sites including historic wrecks, pinnacles, sheer rock faces and stunning underwater topography. Its marine life is surprisingly diverse with tropical species such as triggerfish, Mola Mola and pipefish in the south but also seals, basking sharks and mink whales can be dived with if lucky. Kelp Forrest, nudibranch and wrasse are common as well. 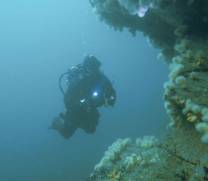 The visibilities can reach over 30 meter, something that not many divers expect while scuba diving in the clear waters of Ireland. On top of this, Ireland is a natural wonder with amazing landscapes.